Greetings from the World Science Festival Star Party! 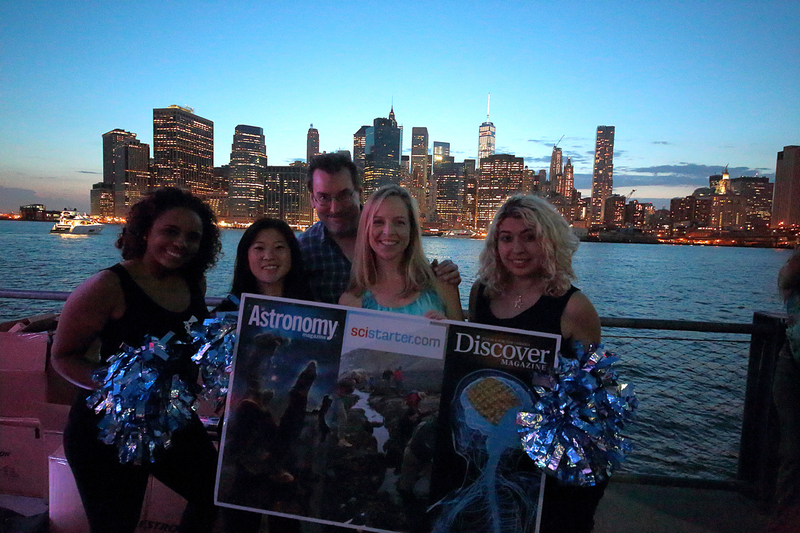 Celestron just sponsored a really big event in New York City, with several thousand people enjoying the night sky with Astronomy, Discover, Scistarter, and the Science Cheerleaders. It was a featured part of the World Science Festival that took place last Wednesday through Sunday, and it was a tremendous success. Thanks to all of you who attended and who we met there. It was incredible fun! What a joy to see so many kids (and adults!) going bananas after getting their first looks at the Moon, Saturn, Venus, and Jupiter. What a glorious Saturday night we had. Some great people on hand included Danielle Olson, Samantha Gromek, Darlene Cavalier, and Hined Rafeh. Danielle is an MIT grad and one of the Science Cheerleaders, having been an MIT cheerleader before gaining her present position as program manager for Microsoft’s New England Research and Development Center. She is also founder and president of Gique. You can find out more about Danielle at her website, http://gique.me/. Also one of the Science Cheerleaders, Samantha has her Ph.D. in pharmaceutical science from the University of Connecticut and is now a researcher at the University of Pennsylvania. Darlene Cavalier is founder and director of the Science Cheerleaders, a former cheerleader for the Philadelphia 76ers, and a contributing editor of Discover magazine. Darlene also leads the Scistarter effort, an important citizen science effort. Please see Scistarter.com. Hined Rafeh is a graduate student working on a master's in science, technology, and society at Drexel University in Philadelphia. Greetings from Astro, Discover, Scistarter, and the Science Cheerleaders!